Glenn Ford (Blackboard Jungle) plays a TV writer and director who kills a blackmailer and buries him under a gazebo. Odd black comedy only works sporadically. I liked the idea behind the film, but it didn’t work for me. Metro-Goldwyn-Mayer’s The Gazebo feels frantic rather than zany. Worst of all, it isn’t funny at all. The Gazebo reminded me of Alfred Hitchcock’s darkly humorous Trouble with Harry (1955), which is also about a corpse causing all kinds of funny situations. 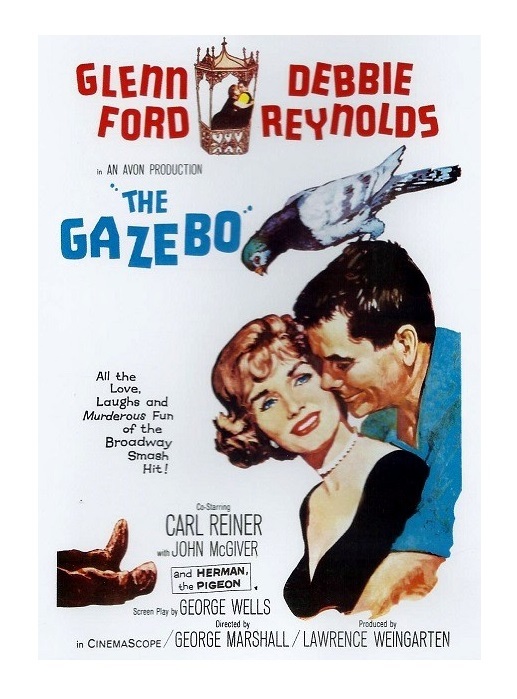 Unfortunately, The Gazebo,directed by George Marshall (Destroy Rides Again), has an erratic and inconsistent tone. The film needed someone like Billy Wilder (Some Like it Hot), who had a knack for mocking the nervy average American. Wilder would have milked the cynical storyline for all it’s worth. The Gazebo was based on Alec Coppel’s Broadway play of the same name. George Wells (Designing Woman) adapted the play. I’m assuming writer Coppel got the idea after working with Hitchcock on Vertigo (Coppel co-wrote the film with Samuel Taylor). There are many Hitchcock jokes (Hitch himself makes a “cameo” appearance). 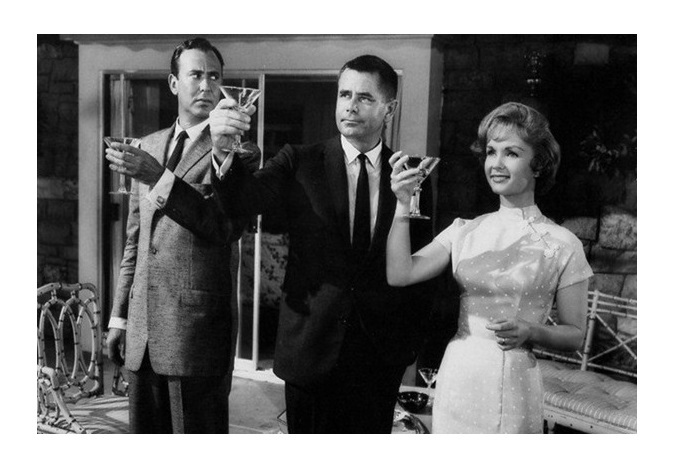 Debbie Reyonlds (The Catered Affair) is delightful as Glen Ford’s wife. Reynolds even gets to do a musical number (she plays a TV actor). Carl Reiner (The Russians Are Coming, the Russians Are Coming) is quite funny as Ford’s buddy. Ford is the problem here; he isn’t funny! Ford is trying to be Jack Lemmon and it simply doesn’t work. Herman The Pigeon gives the best performance, anyway. The feathery guy steals many scenes. Martin Landau (North by Northwest) has a small role as a thug. I can’t really recommend The Gazebo, but Hitchcock aficionados may want to check this one. It is, as far as I can tell, the very first movie to lampoon the Mater of Suspense’s oeuvre. I still think you are better off watching Silver Streak (1976), High Anxiety (1977), or Foul Play (1976), all great Hitch spoofs. B&W, 100 minutes, Not Rated. Agreed. This is an odd film, and not in a good way. Ford is miscast, although I think he tries his darnedest to be funny. (Maybe that’s the problem??) 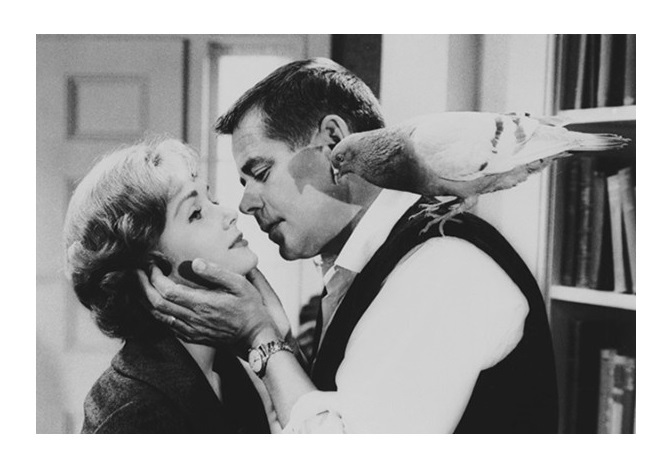 Like you said, Billy Wilder could probably make it work. Yes, Ford tried too hard. I tend to like him, but I thought he was the wrong actor for the role.